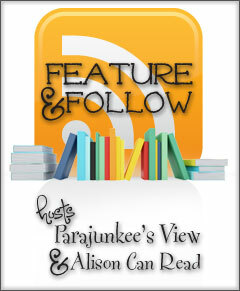 Feature & Follow Friday is a blog hop hosted by Parajunkee and Alison Can Read that expands your blog following by a joint effort between bloggers. First you leave your name here and then you visit as many blogs as you can and tell them hi in their comments. You follow them, they follow you. Win. Win. OMG!! The Red Wedding scene from a A Storm of Swords by George R.R. Martin broke my heart! Mr. Martin really hurt my feelings with that one. In order not to give anything away, I’ll just say there was some betrayal, broken traditions, and just good ole fashioned blasphemy for what happened. I was not amused, I was not happy, and I ached for the events at that blasted wedding. new linky follower/ I can be found and followed at bethartfromtheheart.blogspot.com . Haven’t read that book yet. I haven’t yet read the series. FINALLY found the first book and my fiance is currently reading it. I am not familiar with much high fantasy so hope it will suit me when I try it. I haven’t heard of your book. Ugh.. that wedding scene! I was thoroughly depressed after that. Didn’t see it coming at all. I still haven’t read this series, but I plan to someday. Thanks for not spoiling it for me! Old follower. I didn’t really cry either. But that’s the most emotional I got. I’m not a big crier…so I couldn’t remember the last book to make me cry. So I just went with the last book that got a big emotional reaction out of me!